China is a huge market for UK entrepreneurs. The world’s leading emerging economy accounts for 15% of global GDP and up to 40% of global economic growth. China has a population of nearly 1.4 billion, of which 695 million are mobile internet users. 25% of unicorns – startups valued at over $1 billion – are native Chinese. While China offers UK entrepreneurs massive potential for growth, the challenges - around access to the market, local partners, funding, as well as the language and cultural barriers - are clear. CKGSB’s 14-month, full-time MBA program is helping ambitious professionals overcome the hurdles and break into the lucrative Chinese market. “We provide the kind of in-depth knowledge that you can’t find at any other business school in China,” says Ji Bo, CKGSB’s chief representative in Europe. Indeed, CKGSB boasts a network of over 10,000 high-level alumni. More than half of them are CEOs or chairmen of companies in China, with that select group alone accounting for over 16% of China’s GDP. CKGSB’s 45 full-time resident professors share over 70 internationally-recognized academic awards between them. Rory Bate-Williams is a serial entrepreneur from the UK. He’s just founded a new messaging app which lets users share Snapchat-type images and videos in WhatsApp-type groups. Brexit has only encouraged the strengthening of ties between the UK and China. The local government of Shenzhen – a vibrant startup hub in southeastern China – has an office in Canary Wharf, at the heart of London’s financial district. BusinessBecause caught up with both Ji Bo and Rory at a CKGSB event there, held in conjunction with leading European tech startup accelerator Level 39 and China-focused venture capital firm Silk Ventures. What advice does he have for UK entrepreneurs wanting to make it big in China? “Be open-minded,” he says. “Look at the opportunities that China can offer. “Attitude makes a huge difference. You need to be able to embrace a different culture and work with a totally different kind of people, whether they’re investors, customers, or potential partners. CKGSB’s MBA class is 28% international. 50% of MBA students are women. It’s a global school, with offices in London, Hong Kong, and New York. 100% of CKGSB MBAs land jobs within six months of graduation. “In terms of access to China, CKGSB opens doors for you,” Rory explains. “Whenever I need help in China, I reach out to the school and I’m connected to relevant alumni almost immediately. 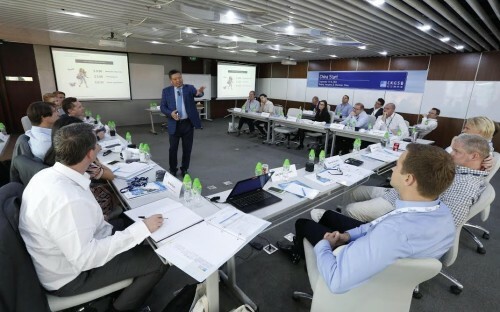 Wherever they’re from and whatever their career goals, CKGSB MBA students benefit from a forward-looking international business school with a unique connection to the Chinese elite.